SHOESTRING has been working to assist Salesian Missions with the launch of an emergency fund to support programs in Ghana, Liberia and Sierra Leone working to help contain the deadly outbreak of the Ebola virus. To get the word out, the PR team at SHOESTRING prepared a press release and has been working with the media outlets (like Bloomberg) to help them with their reporting. Ads were also created to promote the emergency fund. They are also making connections between journalists and missionaries working on the ground. In Sierra Leone, the government has turned to Salesian programs to care for children orphaned as a result Ebola. Salesian Missions has also worked with Stop Hunger Now to deliver lifesaving food and medical supplies to people in need in Sierra Leone and Liberia where the emergency has triggered food shortages. In Liberia, Salesian missionaries—along with local volunteers—are working to reach people at risk in rural areas. They are providing basic information and instructions from the n Ministry of Health, distributing gloves, long-sleeve shirts, and disinfecting agents such as chlorine. The missionaries are reporting that they are in desperate need of these supplies, which is why funds are needed. In Ghana, the Salesian-run Don Bosco Youth Network of West Africa is heading up an aggressive public education campaign in an attempt to head off the kind of humanitarian disaster Ebola has wrought in neighboring countries. Salesian Missions is urging the public to donate to its Ebola Emergency Fund, which will go directly to support missionaries currently working on the ground in countries affected by the Ebola outbreak. 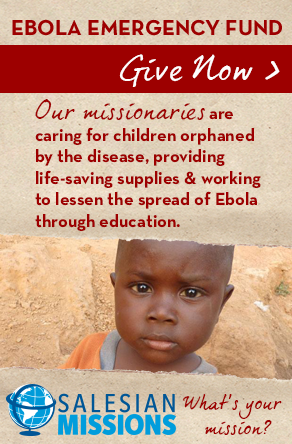 Go to www.SalesianMissions.org/ebola to give. The national PR efforts has made a difference for the emergency fund, and the work being done on the ground in West Africa.